There are plenty of things to do in Manchester, NJ from visiting local state parks to exploring the small shopping areas around. While here, you do not have time to sit cooped up with dental pain and you should not have to either. Fortunately, there are many dentists and specialists ready to assist you here in Manchester. The team at emergencydentistsusa.com has prepared a list of all dentists and specialists available in Manchester. These dental providers are accepting new patients and nearby as well. You can browse the list directly from our website, but should you be in a hurry, you can call our toll-free dentist finder hotline to receive assistance. When you call into our toll-free dentist finder hotline, our team members will assist you in locating a dentist that can meet your needs. We will schedule your first appointment for you and also provide you with directions to the office. We do recommend that you arrive about 20 minutes early for your appointment and that you bring your copayment, insurance card, and your valid ID. Whether you are new to the city of Manchester or you have lived here for a few years, if you experience tooth or jaw pain, there are dental options available. You can choose from general dentists to pediatric dentists, orthodontists, cosmetic dentists, oral surgeons, periodontists, and more. Typically, you will visit a general dentist first and if he or she is unable to treat the problem, you will be referred to a specialist. 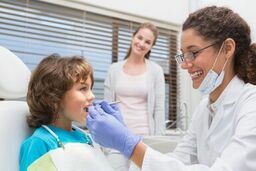 Description: At Dr. Rutz’s Family Dentistry, we are committed to providing you with the best dental services in the area. We have been serving Toms River and the surrounding area since 1989. We work hard to provide you with a dental office that is calm and relaxing. Description: Ocean Dental Care is ready to give you something that you can smile about. Our staff is prepared to provide you with quality services that are designed to meet your individual needs. We work in the most caring and compassionate manner to ensure you find your dental visits informative and personalized. We want you to leave our office as happy as possible. Description: At Lakehurst Dental, we are ready to provide you with the best dental care in the area. We want you to know that you are like family to us and we will treat you that way from the moment you walk into our office. We offer professional dental care with a gentle touch. Our dentists specialize in preventative programs, dental fillings, pediatric dental care, and more. If you are experiencing tooth pain, then you may need to see an emergency dentist. Typically, tooth pain is an alert that there is something wrong inside of your mouth. If the pain has lasted for more than a couple of hours, it is recommended that you do see an emergency dentist. If you have been involved in an accident that has caused tooth or jaw pain, you should visit a local urgent care center or ER first. When it comes to any new dentist, you should make sure that you verify their credentials, licenses, and certifications first. To do this, you should visit the New Jersey Dental Association website and search the dentist’s name.